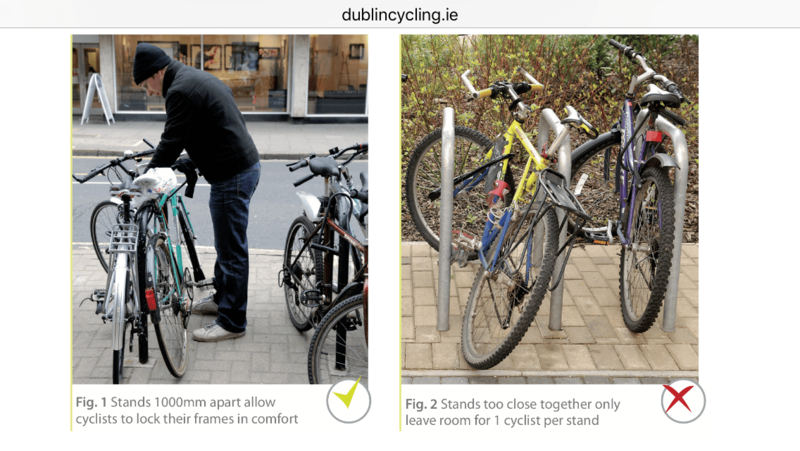 Guidance on the provision of bicycle parking was launched this morning by the Dublin Cycling Campaign. The guidance is focused on the Dublin City Council area and is aimed at planners, developers, employers, and property management companies. The guidance can be found here and you can contact the campaign directly at info@dublincycling.ie. I applaud anything that might reduce the amount of dreadfully poor bike parking facilities out there. The number of people who seem to think bolting a toast rack next to a wall is acceptable is frustrating.